Egypt will demand Ethiopia stop building a dam on one of the main tributaries of the Nile, a senior government aide said on Wednesday, ramping up a confrontation over the project that Egypt fears will affect its main source of water. Ethiopia set off alarm bells in Cairo last week when it began diverting a stretch of the river to make way for the $4.7 billion hydroelectric plant. Countries that share the river have argued over the use of its waters for decades - and analysts have repeatedly warned that the disputes could eventually boil over into war. The high stakes involved were underlined on Monday when senior Egyptian politicians were caught on camera advising President Mohamed Morsi to take hostile action to stop the project, and one went as far as suggesting Cairo destroy the dam. Egypt, which has been involved in years of troubled diplomacy with Ethiopia and other upstream countries, said Ethiopia must now halt work on the dam. "Demanding that Ethiopia stop construction of the dam it plans to build on the Blue Nile will be our first step," said Pakinam el-Sharkawy, the presidential aide for political affairs, in comments carried on the state news agency MENA. "The national committee that will be formed to deal with this issue will determine the steps that Egypt has to take." No one from the Ethiopian government was immediately available to comment. Senior Egyptian politicians called in to discuss the crisis with Mursi on Monday were apparently unaware their meeting was being broadcast live on television. The leader of Egypt's Ghad party, Ayman Nour, suggested spreading false reports that Egypt was building up its air power. "We can 'leak' news information claiming that Egypt plans to buy advanced aircraft to increase its aerial presence etc., to put pressure, even if not realistic, on diplomatic discourse," he said. Younis Makhyoun, leader of the Salafi Islamist al-Nour party, was filmed saying Egypt should back rebels in Ethiopia or, as a last resort, destroy the dam. The broadcast triggered widespread ridicule, particularly among Egypt's vast army of users of social networks. "Among Morsi's achievements: the first 'secret' meeting in the world to be aired live," read one joke that made the rounds. Egypt has so far not apologised to Ethiopia for the broadcast - el-Sharkawy's main response on Twitter was to say she was sorry members of the meeting did not know they were being broadcast. The most prominent expression of regret came from leading opposition figure Mohamed ElBaradei, who was invited to the meeting but did not attend. "Sincere apologies to the people and governments of Ethiopia and Sudan for the irresponsible utterances at the president's national dialogue," he tweeted. Ethiopia has laid out plans to invest more than $12 billion in harnessing the rivers that run through its rugged highlands to become Africa's leading power exporter. The centrepiece of the plan is the Grand Renaissance Dam being built in the Benishangul-Gumuz region bordering Sudan. Now 21 percent complete, it will eventually have a 6,000 megawatt capacity, the government says, equivalent to six nuclear power plants. Cairo argues that Ethiopia has not properly considered the dam's impact on the river, saying that a report put together by experts from Egypt, Sudan and Ethiopia is insufficient. Come on we are just using our water for hydroelectric power ,nothing more. 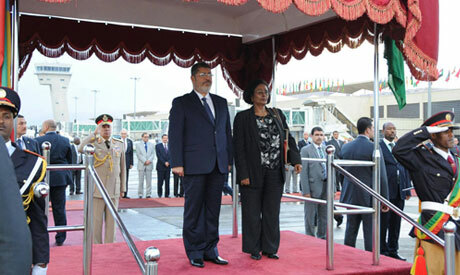 come on Egyptian brothers ,you can not think only for you self and development . we want also to grow and develop with out affecting others . any way we will not stop building the dam and we will pay what is necessary. No doubt,Ethiopia has aright to make it's right without waiting for others perior permission.Because Ethiopia should have to improve each citizen's life,so each individual ready to stand beside of our country. we have the right to share the water even if we are not use the water for irrigation. so the Egypt must respect our right to use the water which not have any impact on water follow. it is not clear to me why they became angry in the dam.